Las Vegas based Tech.Co (formerly Tech Cocktail) believes in celebrating entrepreneurship, community, and technology, and nowhere is this party bigger than at SXSW. For the last five years, the Tech Cocktail team has mixed together the nation’s brightest startups in a venue jam packed with technology enthusiasts, and served over cocktails. Tech Cocktail’s 2016 Startup Celebration promises to be their best event yet. Join Tech Cocktail as they showcase 30+ of the most innovative and disruptive startups across the world while enjoying a night of great conversation, giveaways, and of course cocktails. Past showcased startups at Tech Cocktail events have gotten great feedback, been funded on the spot, met new employees, investors, and some have even be acquired. 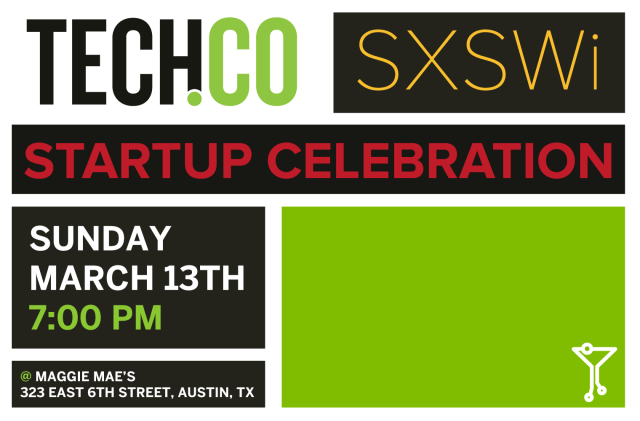 Get more information on Tech Cocktail’s Startup Celebration at SXSWi here.